Denis O'Sullivan is still waiting for his first win since 2005 after a closing 75 smashed his chances of lifting the OKI Castellόn Senior Tour Championship. The 61-year old Cork veteran was just two shots off the pace starting the day but finished tied for ninth with Des Smyth on five under - eight shots behind Australia's Mike Harwood. Harwood carded a final round 66 in windy conditions at Club de Campo del Mediterráneo to finish three strokes clear of overnight leader Angel Franco as Sam Torrance edged out Ian Woosnam by €3,380 to win the Order of Merit for a third time. 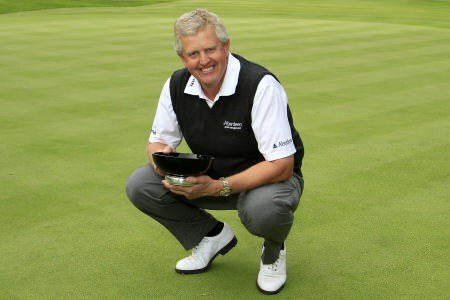 Winner of the 1990 Volvo Masters, Harwood became the first player to win the season-ending title on both the European and European Senior Tour. Torrance ended the year on €170,696 following his victory in the DGM Barbados Open and four other top five finishes, including fifth in The Senior Open Championship presented by MasterCard at his home course Sunningdale. It was Torrance’s third Order of Merit victory following 2005 and 2006, meaning he equals Carl Mason’s total and is now just two behind Tommy Horton’s benchmark of five. Des Smyth was the top Irishman in the Order of Merit as he finished 15th with €93,453. Eamonn Darcy was 23rd (€71,112), Jimmy Heggarty 27th (€63,476), O'Sullivan 34th (€53,913), Eddie Polland 83rd (€4,854) and Peter O'Hagan 95th (€1,743). Sam Torrance re-wrote the record books with a stunning second round 63 to place one hand on his 11th European Senior Tour title at the DGM Barbados Open. Cork's Denis O'Sullivan found his putting touch to trail Paraguay’s Angel Franco by two strokes heading into the final round of the OKI Castellόn Senior Tour Championship.